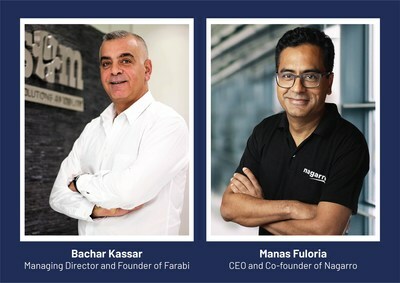 DUBAI, UAE, April 4, 2019 /PRNewswire/ -- Nagarro, a global provider of high-end technology services for digital innovation and breakthrough performance, has acquired a controlling position in Dubai-based Farabi Technology Middle East LLC and its subsidiary Solutions 4 Mobility LLC, both award-winning technology companies focusing on digitalization and mobility across the GCC region. Bachar Kassar, Founder and Managing Director of Farabi, said, "I'm very excited to be able to create global opportunities for our talented colleagues and to deliver the top-class global capabilities of Nagarro to our existing clients." Manas Fuloria, Co-founder of Nagarro, said, "We have already been collaborating with Bachar and his colleagues for over a year and are very impressed with both their engineering skills and their commitment to client delight. We also think the companies are similar from a cultural perspective. We eagerly look forward to deepening our working relationship and having fun doing so." Established in 1993 in Dubai/UAE, Farabi Technology Middle East LLC is a leading integrator for business process and integration and a service provider for Enterprise Application Integration. Farabi's subsidiary, Solutions 4 Mobility LLC, is an award-winning digitalization and mobility partner in the mobile banking, automotive and government space.